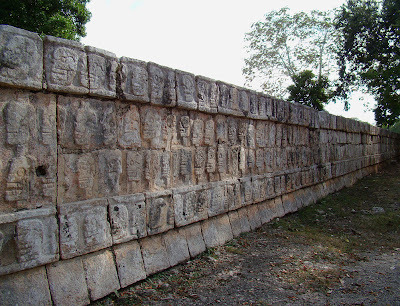 Chichen Itza, the Mayan city of stone, has been standing for almost 2000 years. The details of the city’s founding are unknown, and centuries later it was abandoned for reasons that remain shrouded in mystery. One thing is certain: Chichen Itza was built by the Mayans, who erected this Wonder of the World without draft animals, wheels, or metal tools. The same people created a system of writing, developed a calendar, and drew charts of the night sky while Europe plunged into the Dark Ages. 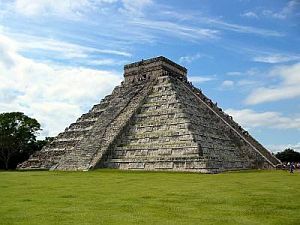 Chichen Itza is located in the Mexican state of Yucatan. 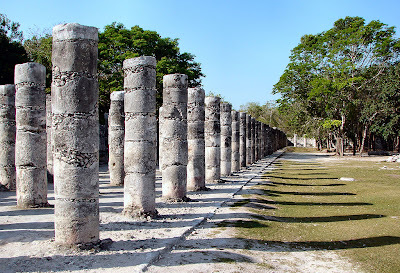 The region is arid, but Chichen Itza was founded near two cenotes—deep wells of natural water—which made habitation possible. In fact, Chichen Itza means ‘at the mouth of the well of Itza’, so even its name hints at the importance of the two cenote. 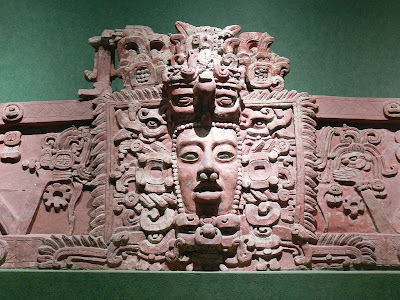 The cenotes were central to Mayan life, and not just because they provided fresh water. Chichen Itza was dedicated to the worship of Mayan gods, and one of the cenotes was used for ritual sacrifice. People were thrown into the cenote as an offering to the god of rain. Archeologists have explored the cenote thoroughly, dredging up artifacts like pottery and gold–and human skeletons. 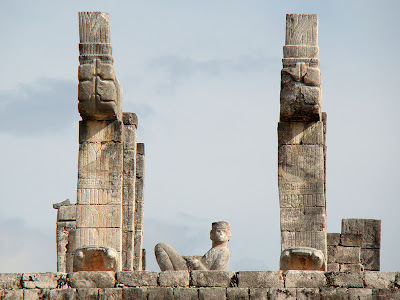 El Castillo, the great temple, stands near the center of Chichen Itza. 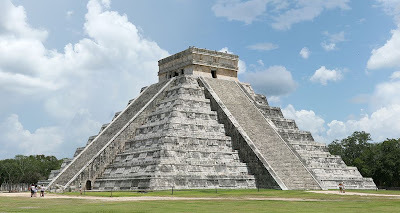 Dedicated to Kukulcan, the plumed serpent-god, the step pyramid rises 75 feet; and because there are 365 steps leading to the temple at the summit, archeologists believe it may have also been used as a calendar. 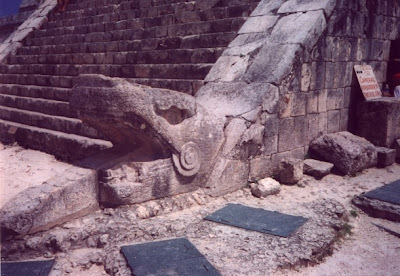 Two huge serpent heads are carved into the bottom of the steps on the northern side, and each year on the equinoxes, the interplay of sun and shadow gives the impression of a snake descending the stairs. 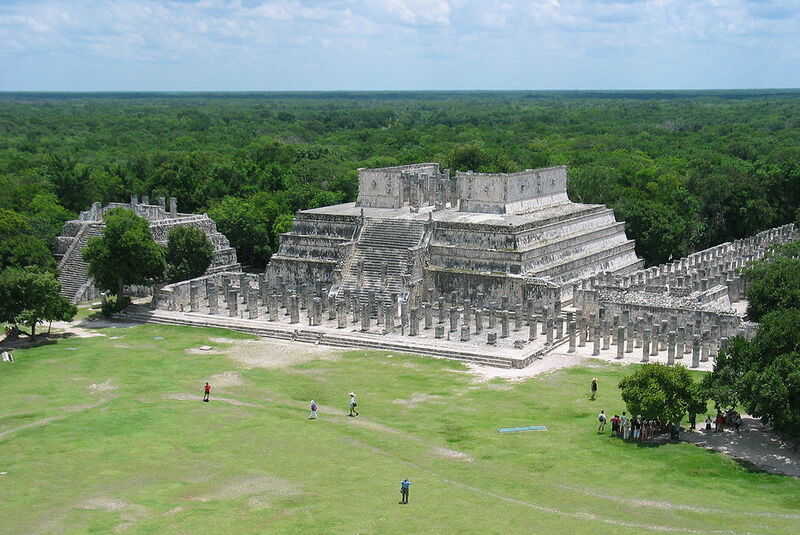 Like all the structures at this site, El Castillo has been bleached white by the years. Once, though, it was painted in vibrant colors and decorated lavishly. 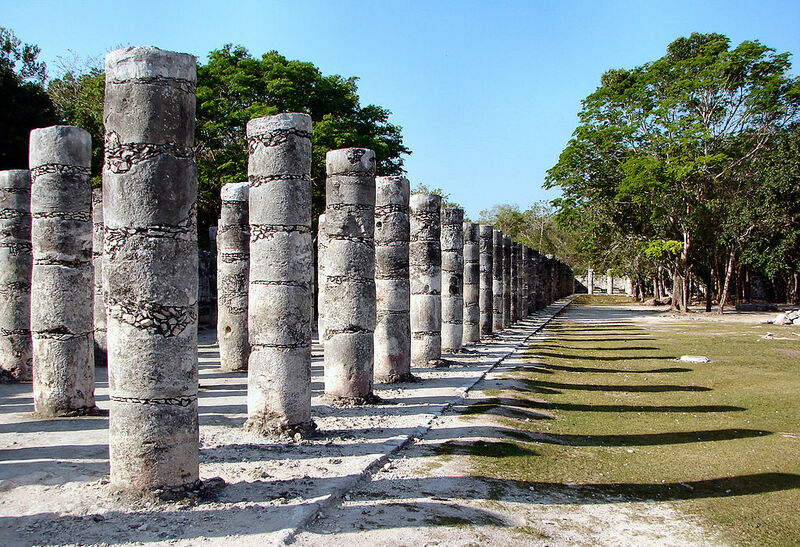 Just beyond El Castillo lies the largest ball court in ancient Mesoamerica. Two high walls embrace the playing field where skilled athletes played pok ta pok, a game of life and death. Pok ta pok was played by two teams of six players, and the goal was to get the ball through a ring that jutted, 21 feet high, from one of the walls. Players could use any body part except their hands. The feat seems insurmountable, and in fact, the ball seldom made it through the ring. When it did, though, the captain of the scoring team was honored by being decapitated as a sacrifice to the gods. And it was an honor, because a player who died this way went straight to heaven. The Caracol is the most atypical building on the site. It doesn’t follow the usual Mayan taste in architecture; the building is round, and contains a spiral staircase, which led to its nickname, ‘the snail’. In the ceiling and walls are windows that open up to particular stars; archeologists believe that this building served as an observatory. The area around Chichen Itza depends heavily upon tourism—and the tourists come! At least a million people visit this out-of-the-way site each year. Some tourists make it a point to visit on one of the equinoxes so they can watch as the plumed serpent descends the steps of El Castillo.